Now I'm sure most of you ladies out there has tried or at least heard of Taobao.com , a shopholic & bargain hunters' paradise. 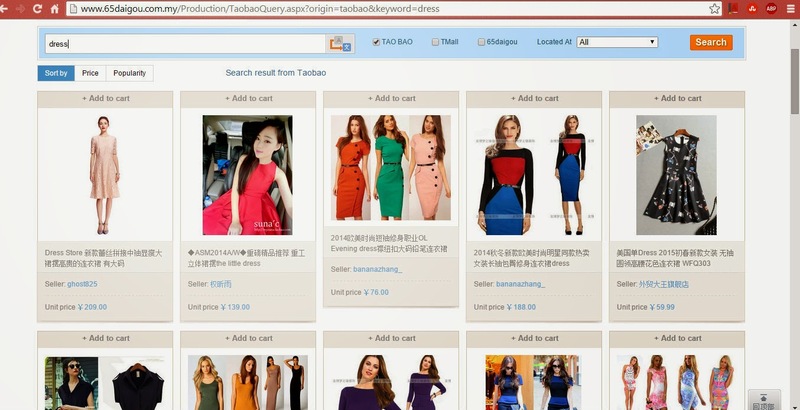 Taobao.com is one of the largest online shopping mall from China selling clothes, handbags, accessories, houseware and so much mall at ridiculously cheap prices. However, shopping at taobao has it's setbacks. Firstly, there's this language barrier for non-Chinese speaking shoppers. And secondly, one have to contact a reliable taobao agent to ensure a fast and efficient shipment of the parcels and also to obtain an affordable shipping rate. Thanks to 65daigou, I managed to buy a prom dress for less than RM50 on taobao and had it delivered to me in less than a week! 65daigou is the first and No.1 Singapore registered company specialized in overseas (specifically China and Taiwan) purchasing, logistics and international shipping. 65daigou has since broadly accepted by Singapore Customers and become the largest overseas shopping platform in Singapore. 1. Browse through 65daigou for things you wish to purchase. Eg: dress, skirt, bag. The search bar automatically translate your search to Chinese for a more accurate search result, which really helps semi-bananas like me! 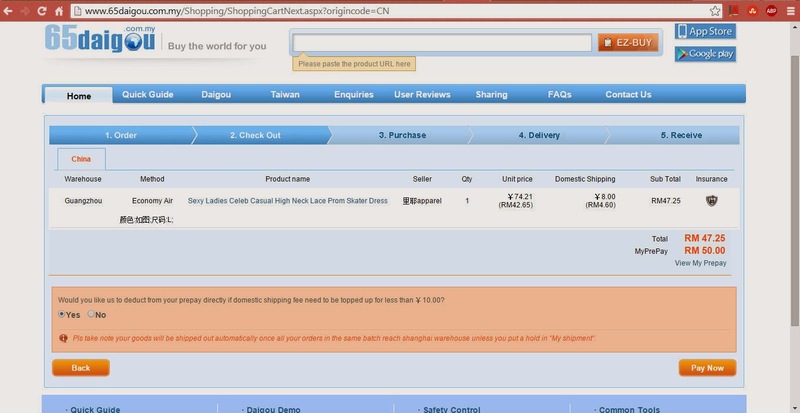 Already have something on your mind to purchase from taobao.com? You can copy and paste the link of the item you wish to purcahse directly from taobao at 65daigou on the EZ-BUY bar on the top right of the webpage. 2. Review the product on the product page. Price are quoted in Yuan. Make sure you get your desired colour/size of product right. Click on "Add to Cart" once you're satisfied with the product. 3. Proceed to Checkout. Choose Shipping method. 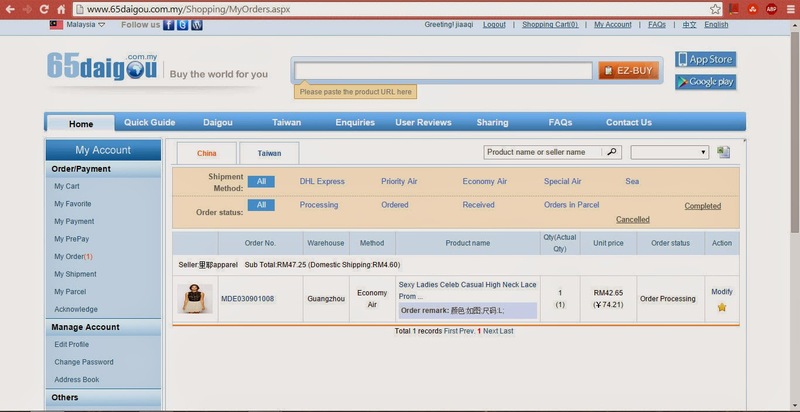 65daigou has 5 different shipping methods for international shipping from China & Taiwan. 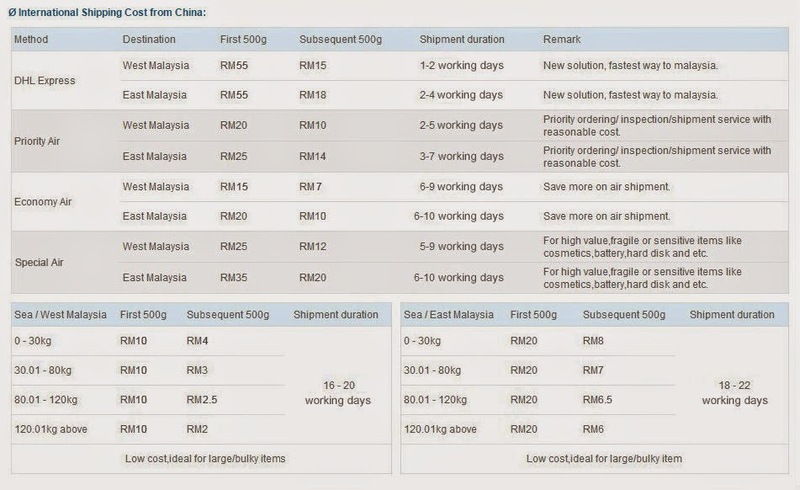 Customer can opt for Air Shipping for the shortest shipping period or Sea Shipping for a more budget approach but longer shipping wait time. 5. Proceed to payment. 65daigou uses prepaid system where customer top up a certain amount of cash into their 65daigou account. Customer can opt for Credit Card Payment/Pay Pal/Online Banking/ATM Transfer to top up. Pretty convenient, isn't it? 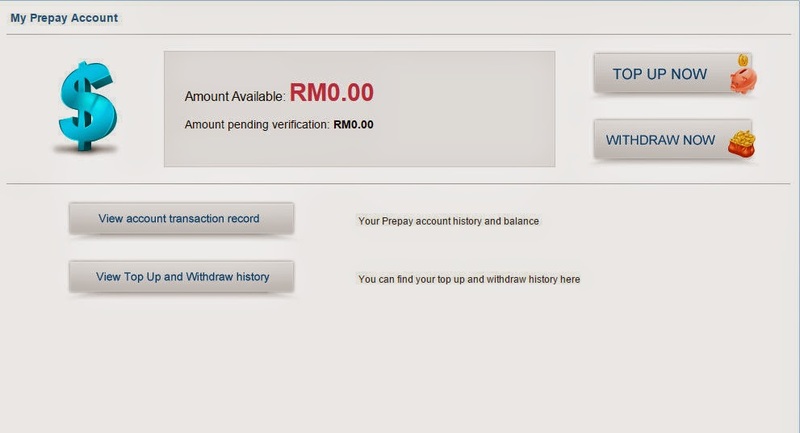 65daigou even allow you to withdraw money back from your prepay account! Visit http://www.65daigou.com.my/Help/payment.html for more information. Once your payment has been settled, your items will be shipped out ! What I really love about 65daigou is the efficiency on the shipment. 65daigou alerts me whenever my parcel arrives at a warehouse/got shipped from a certain location. The MCD's Drive-Thru Self Collection option allows me to save RM5 on shipment and receive a RM5 discount voucher for McD! You can choose up to 16 McD Drive-Thru collection point to collect your parcel. 65daigou car sticker will be mailed to customer’s address. Stick the car sticker on your windscreen for pick up verification. Once you drive into your selected McDonald’s entrance, 65daigou staff will recognize your car sticker and give you a hand signal to proceed. You can choose a time and date that is convenient for you to pick-up the parcel. Yes, there's self-collection services too on Saturdays! Overall, I am really satisfied with 65daigou. 65daigou provides free insurance, free product inspection, On-Time Shipment Guarantee, System Tracking , Local and friendly customer Service and support & also a point collection system which allows customer to redeem voucher from the accumulated points. Now, shopping is made easy with 65daigou's ANDROID & IPHONE APP! 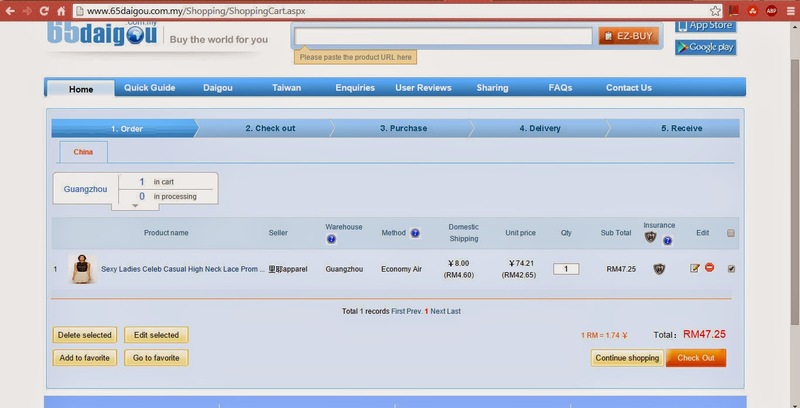 Shop anywhere, anytime on your smartphone with 65daigou app. 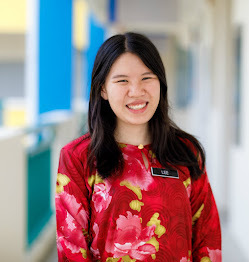 Register now at 65daigou and receive a RM10 65daigou voucher! Key in DG0309A to receive a RM10 voucher during your registration and start shopping now! Offer valid till 5th of June 2015 (2 months from now!) =.